The Meteorologists are calling for a White Christmas here in East Tennessee. We'll see if they're right! We call today "Christmas Adam" at our house, because it's the day before Christmas Eve, and Adam came before "Eve"! We're weird fun like that. Some people participated in an "Open House" last week, but I wasn't ready, so I didn't participate. 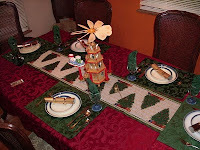 So, here is a tour of my house dressed up for Christmas. One of my SILs gave me this little guy years ago. Our next door neighbor from Ga. gave us this...it sits on the fireplace insert in the kitchen. Holiday train that use to have a place at the top of our stairs in SC. It's on the desk next to my kitchen tv. The front hallway. The tower on the left was a gift from a student. It plays "Away in a Manger"
CH's aunt (now deceased) gave us this plate our first married Christmas. We don't have a fireplace that has a mantel upstairs, so we put the stockings on the divider between the living and dining rooms. I took this picture before FES was here; there are now 6 stockings! The tables on either side of the couch. These were gifts from the boys, my MIL; my mom painted the pictures that are framed. A couple of Santas in the hallways. The lower one is actually a piece of wood that someone painted to look like Santa. I think I got it at the Christmas show in Charlotte when we lived in SC. The planter on the front porch. My sister (you know, the one who gives me stuff!) gave me the snowman. Another sister supplied the jacket and scarf: they were her sons' (and got passed on to me) when they were little. This is one of my most favorite decorations. My MIL gave us this Santa. When you turn it on, it snows and plays "Santa Claus is Coming to Town". The runner it's on also came from my MIL. This is the hi-fi that came with the house. CH wanted to keep something that belonged to the previous owner (who built the house), so this is what we got. I have a few snowmen and Christmas village buildings. This is also where Ally & Pepper have their stockings ready for Santa Paws to fill. The dining room table from last year, 'cause, heeeeelloooo, this year's table has tins all over it. Here is our tree this year, before presents. The tree skirt was also a gift from my MIL. 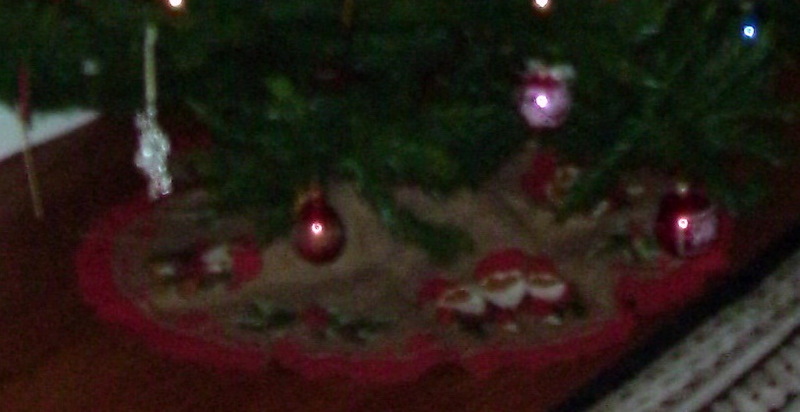 These last pictures are Christmas items that are Danish. They hold a special place in my heart. Enjoy! Our new ornament from CH's uncle and LF. Oh thank you for sharing your beautifully decorated home with us. Have a Merry Christmas and a Blessed New Year. I love that song thanks for sharing!! Have a very Merry Christmas!! Everything looks very festive. We've been organizing, cooking and finishing up the wrapping/shopping today. I did not get any further than the IGA in town. We may get out and about tomorrow. Let me know if you head this way at all too. It's a little crazy just now but hope to maybe see you at some point ! I LOVE that song. Especially this year. She talks about going to LA where we are from and then how she just wants to be in TN where we are. LOVE it! Your home is so festive and pretty!!!!! I am sure your family appreciates you using all the goodies that you have been given. It took me longer to clean up the kitchen than to mess it up. It all looks so pretty and festive. THanks for sharing. I also like your new header photo. Absolutely gorgeous!!! May you and your family have a blessed Christmas! Christmas Adam, I like it! Your decorations all looks so pretty and they all hold special memories for you. I have really enjoyed seeing everyones decorations. Thank you for sharing yours. What festive home!! I hope you all had a fabulous holiday together!